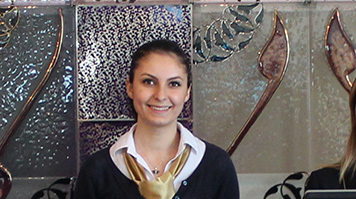 Gamze is a student on our BA (Hons) Tourism & Hospitality degree. "I arrived at LSBU after what was quite a last minute choice," she explains. "I found the degree online and decided to apply, but I'm delighted to be here and have definitely found the right course for me." In order to increase her global employability prospects, Gamze decided to undertake her work experience abroad through the Erasmus programme. "Being part of Erasmus was a great chance that I didn't want to throw away," she says. "I wanted to make the most of discovering new things about life and myself, and to take on responsibilities so that I will be confident in myself and my abilities no matter where I am in the world. I believe that you learn a lot more when you take chances, so undertaking two work placements in foreign countries was the ideal opportunity to gain extra experiences that simply wouldn't be possible in the classroom." Gamze secured two work placements, one in Barcelona and the other in Istanbul. "Taking two work placements was a great advantage to me," she says. "Not only did I experience two very different cities, but I was also able to undertake different types of role too, which gave me wider experience of both Tourism and Hospitality. " Even though she is a Turkish national, Gamze was not familiar with Istanbul until a stopover as part of a family holiday led her to fall in love with the city. "That's the moment when I decided to try and secure a work placement there," she says. "It was love at first sight, from the architecture to the people and traditions, so I was really pleased to find a work placement in a hotel there. I was able to stay with a relative too, so although it was a new experience, I was also still in my comfort zone which made it even easier to make the most of the experience." Barcelona, however, was an even bigger step into the unknown for Gamze. "I did find myself wondering whether or not I could do it," she admits. "I had been there previously on a field trip as part of the course, but I was still on my own in a strange city. However, I needn't have worried. My placement, at Bensim Travel, was in the perfect location – right in the city centre and close to all the attractions. It also helped that the office environment there was so friendly and relaxed. Everyone did their job, but it was a very casual atmosphere and it was a great experience working there." Gamze believes that the Erasmus programme has helped her to develop her CV so that it really stands out when it comes to finding employment in the future. "Practical knowledge is as important as academic understanding, as you need to gain first-hand experience in the field you want to work in," she says. "My placements have helped me to learn how to deal with new situations on my own, to challenge and be challenged. These are invaluable skills that will help me to stay one step ahead when it comes to my career." Gamze is quick to recommend Erasmus to anyone considering it as part of their studies. "It gives you the chance to learn so much about a place, its culture, people, history and more," she says. "But more than that, it gives you the chance to learn more about yourself. It's a once-in-a-lifetime experience that gives you a whole new vision of life. I loved every moment of it, and I hope to build on it in the future."